I know this seems way out of season, but we made these at the end of the summer this year with some dear friends of ours. The recipe came from them and they had gotten it from another friend. So it’s just been passed around! I certainly can’t take any credit for it, but it sure is good! We followed this recipe pretty closely and it was amazing. I’m only now just posting because they had to sit for a few weeks. Since we are hoping to move and get our house on the market I’ve minimized the “stuff” we have around the house and that includes all of our yummy foods that have been canned. Fortunately my mother in law has let us store stuff in her basement and all my canning is there and all of the pickles too! While we were there at Thanksgiving I decided to grab a few jars of the pickles… I took two jars and they only lasted for 2 days! The kids and I LOVED them! They aren’t sweet at all, have a slight dill flavor and are a tad spicy! Baby A was eating them like a champ and every few bites would make a funny face and scratch her tongue! That didn’t stop her! She went right back to eating them! Tonchi liked them (who is my pickle fanatic), but would only eat them a nibble at a time. He said they were too spicy for his tongue. Koa didn’t seem to even notice there was any spice. As fast as I could hand them to him, they were gone! I purchased about 60 pickling cucumbers from the farmers market a day before we were going to do the canning/pickling. I didn’t get a price break at all, so next year I’m going armed and asking for a box with a discount! I’m definitely making more next year, cause these definitely aren’t going to last til the end of next summer! Our dear friends came over to help. We split the work and the final product! It was so nice to have extra hands in the kitchen and other hands to keep the kids entertained! It only took us about 3 hours start to finish… but that is with two adults in the kitchen and three kids occupied by another adult! 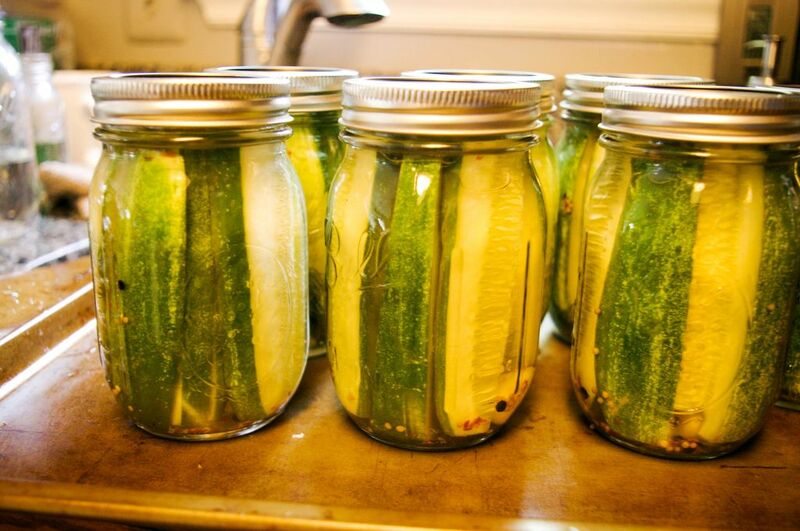 So the reason why I post this now is that we are on a huge pickle eating frenzy and since we were so addicted I figured I had better share the recipe now, so that you are good and ready when the season arrives to make a batch or two or twenty of your own! Step 1: Soak the cucumbers over night in a bowl of water in the fridge. This is very important if you want crisp cucumbers. If you want mushy ones, then you don’t have to soak in the fridge! 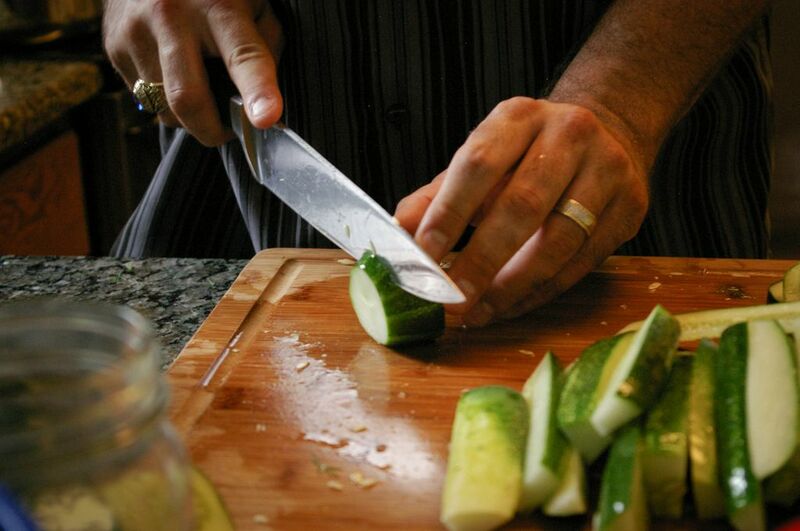 Remove and cut in slices, spears or if your cuces are small enough keep them whole. Boil the jars, rings and lids for about 10 minutes to sterilize them. Or you can run them in the dishwasher on the sanitize cycle. Remove them, place them on a towel and pack them hot. Pack the jars with a dried red pepper (or with slices of fresh jalapeno), a clove of garlic, some fresh dill. Then pack in the cucumbers… tightly. Pour the hot brine into the jars leaving about ½ inch headspace. Make sure you wipe the rim of the jar, before adding a lid and ring. As soon as you have lids and rings on, return them to the boiling water/water bath, for ten minutes only (they get mush when you forget to set the timer.) Be sure that the water in the water bath completely covers the tops of the jars. Then eat and enjoy! Last week when we finished one of the jars I couldn’t bear to throw away the brine. So I cut up some carrots and packed the jar so that the brine covered the tops of the carrots and let them soak for about 1 week. We had pickle flavored carrots and the kids will eat the whole jar of them for an afternoon snack! If you give this a try let me know how they work out for you! I can’t wait to try these. We grew picklingcucumbers this year and the first batch i made were soooo mushy and salty.